Enjoy the lifestyle of resort living at the Mission Inn Resort & Club in this lovely Spanish Mediterranean design home. It is located on the 9th tee of the Las Colinas course with a relaxing view of a tranquil pond. 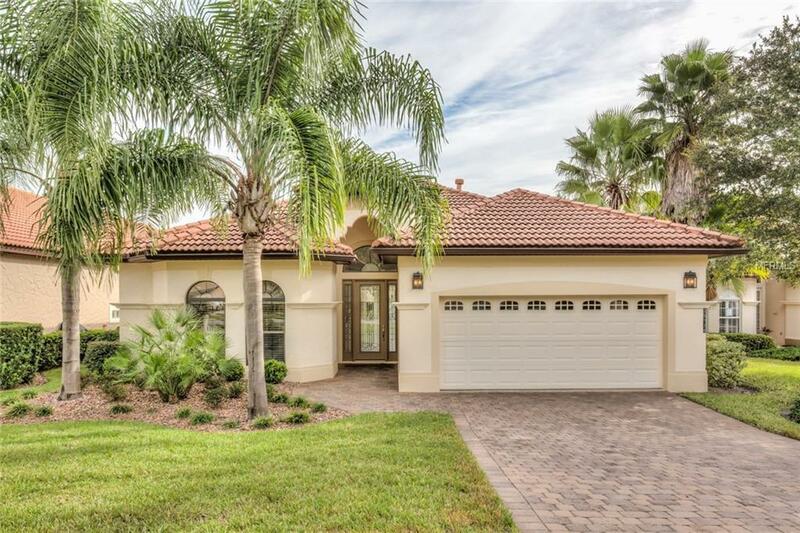 The 14' high entry into the foyer gives the amazing feeling of openness and light, due to the 12' high tray ceilings with crown molding; plus the 8' high tinted sliding glass doors facing the east to the paved lanai. Architectural details include 20" ceramic tile, columns & built-in entertainment center are eye pleasing. The ample dining room boasts of an elegant chandelier & next to the butler's pantry, with pebble glass cabinetry. In the kitchen are stainless steel Whirlpool appliances and block glass above & below 42" cabinets. The master suite is lovely with its bay windows & beige carpeting, plus 2 walk-in closets. A spacious master bath has 2 separate sinks, a garden tub & a walk-in shower. A second bedroom & bath are off the foyer. The 3rd guest room could be an office or den as it has French doors & a closet. Many upgrades of superior quality include: central vacuum with floor sweep, 7 ceiling fans, expensive designer lighting throughout, & a security system. The two car garage has extra space for a golf care. Attention: The initiation fee for Sociall or Golf membership is 50% reduced.